Leading the nominations was the recent surprise blockbuster hit Miracle in Cell No. 7, which last month became the third highest grossing Korean film of all time, which received mentions in six categories. Following close behind with four nominations apiece were the blockbuster fantasy A Werewolf Boy, the romcom All About My Wife and the acclaimed gangster film New World. Meanwhile the huge period hit Masquerade, the action blockbuster The Berlin File and KIM Ki-duk’s Golden Lion-winning Pieta also received a trio of nominations each. Miracle in Cell No. 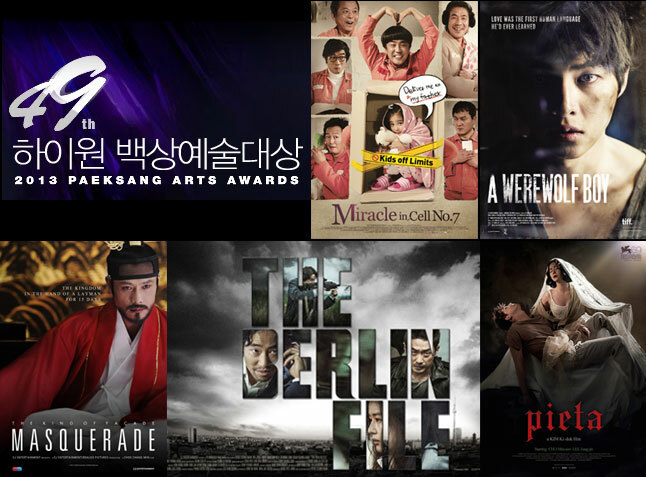 7, Masquerade, A Werewolf Boy, The Berlin File and Pieta were all nominated for Best Film, representing the most commercially and internationally successful films of the past eight months, which has been a particularly busy time for Korean films. In 11 other categories, a wide swath of films, representing both the commercial and independent sides of the Korean film industry, were recognized. The Best New Actor, Actress and Director categories feature a range of exciting new talent from Eungyo’s KIM Ko-eun and Nobody’s Daughter Haewon’s JUNG Eun-chae in the actress category, to JO Sung-hee (A Werewolf Boy) and PARK Hoon-jung (New World), the acclaimed sophomore directors. The best and brightest of the Korean film industry are set to duke it out on May 9th, when the 49th Paeksang Arts Awards take place.